Technology is the backbone of e-commerce. Not only does it help connect sellers and customer on mobile and web platforms, but also enables the effective management of customer orders, deliveries, returns and payments of purchased goods. In fact, technology plays an important role throughout the value chain, in areas such as recruitment, marketing, and advertising, among many others. Technology even enables search, customization, and personalization for customers, which is fast becoming an obligatory feature expected from any e-commerce venture looking to succeed. As technology becomes more advanced and sophisticated over time, its role reaches critical levels of importance in the e-commerce value chain. At a high level, electronic commerce is based on technologies engaged in mobile commerce, online transaction processing, electronic data interchange (EDI), inventory and supply management systems, automated data collection systems, and digital marketing. It can also be accompanied by wider technologies for mobile devices, social media, and email tools. Amazon and eBay were the first marketplaces to use the benefits of e-commerce to buy and sell mass market goods online. Imagine – this year Amazon turns 25 years old! During this period, consumer interest and participation in online shopping has risen significantly. It is no wonder that over a quarter of the world’s population (2.14 billion) will become digital buyers by 2021. Currently, e-commerce vs brick and mortar statistics state the dominance of the latter. On the other hand, the ecommerce industry continues to grow on an annual basis, with 11.9% of total sales in 2018. Thus, it is just a matter of time until most of our purchases are made online. Nowadays, customers hold the power in the market, as they have a vast number of offers to pick from. Thus, it is not solely your product that allows you to stand out from competitors; it is a customer-centric shopping experience built around your brand to keep customers. Everything from an intuitive order process and payment possibilities to fast delivery has an impact. This augmented service is intangible and requires a lot of effort. It is here that new e-commerce technologies and applications offer solutions. Today, all well-known brands are represented online by an ecommerce store, shopping apps, marketplaces or even all of these things simultaneously. Every effort is made to acquire more clients online. Here are the trends currently shaping the e-commerce industry. Naturally, social commerce is the use of social networks for online shopping transactions. Social media is embedded in our daily activities. This fact effectively changes the buyer-seller landscape. Brands stay in touch with their clients via popular social networks to create a personal relationship. More advanced technical features are integrated into social media that are directed to shorten the buying cycle. In the future, the one-click “Buy” button will likely be adopted by most social networks. The combination of e-retail and social media has resulted in evolving P2P marketplaces. Facebook and Instagram are the greatest examples. 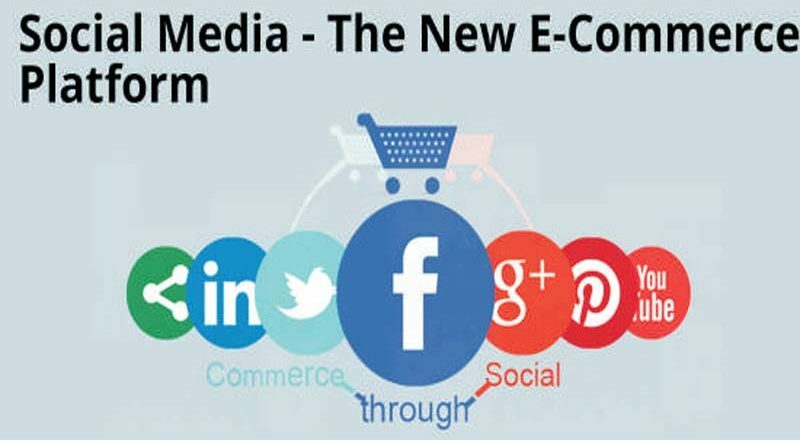 It is real fact that the social e-commerce growth rate is on track to increase by 25% over the next 5 years, to make up more than a quarter of the total e-commerce market. Using applications on smart phones and tablets to buy and sell products is known as mobile-commerce or, more simply, m-commerce. Today, the percentage of consumers using mobile devices constitutes a half of all internet traffic, meaning it is of high importance that e-commerce shops adapt to mobile screens and, in some cases, even build a separate app for the specific purpose of reaching these buyers and following mobile e-commerce trends. Solely the presence of a website or mobile app does not guarantee tremendous success. It is important to make sure that you create the best online shopping experience. Client engagement and retention are key indicators to focus on. Valuable information on this topic can be also found here: How to Engage and Retain App Users. Mobile shoppers are particular, so even the slightest issue can change their mind and lead them to buy from a competitor. Meanwhile, the more advanced functionality embedded into mobile apps sets up some new game rules. The invention of the devices such as Beacons and Dash Buttons actually showed the value of having a branded ecommerce mobile app. These gadgets trigger interest and engagement on the mobile app, which in the end increases sales. This technique offers a completely new e-commerce experience formed from an analysis of former purchases and buyer behavior. Research shows that mobile users expect to have as easy of an e-commerce shopping cart process as possible. This advancement in the mobile cart, along with a growing interest in digital coupons, will be responsible for almost half of sales in e-retail. Electronic wallets simplify the payment process. Online services like Apple Pay, Pay Pal, Stripe, and Google Wallet allow for easy electronic transactions. Moreover, digital wallets can be synchronized with your bank account. This data, along with your driver ID, health card, etc, can be stored in the phone. As well, with the universal acceptance of NFC (near field communication) technology, we wirelessly connect to terminals for in-store payments using our smartphones. Beacons drive retail sales while, at the same time, providing a personalized mobile shopping experience. According to a presentation by Apple in 2013, beacons are heavily used by top retail stores. Urban Outfitters, Macy’s, Target, and CVS all use them to build personalized content strategies. The device transmits Bluetooth signals to nearby smartphones that have the correct branded app. This increases the chances to use the app more often and actually complete the purchase. Sephora utilizes beacons to gather consumer information and send personalized promotions. This appliance from Amazon offers easy order-placement of the most regularly purchased goods. These button devices are tagged to a place where these goods are often used. Then, using the Amazon app, a user can preliminarily set up the orders. This new technology trend in e-commerce will likely soon be imitated by other top players like Costco and Walmart. This approach is called omni-channel, meaning all the means of interaction with a customer should provide the feeling of one entity. Each detail of a particular company, its brand, marketing content, and ads should communicate the same concept. In order to stay competitive, enterprises will need to employ an omni-channel strategy. This complex system implies a high-load backend to maintain and merge data from all the sales and social channels. These are the trendsetting processes at the present time. However, merchants should understand that as technology progresses, there will continue be transformations in how we interact with and buy goods. The tech adoption curve helps to evaluate the risks of employing new technologies used in e-commerce. It illustrates the most prominent e-commerce innovations influencing the industry and their level of acceptance by the public. Naturally, it takes some time before being adopted by the majority in the e-commerce system, but keeping an eye on the technological advancements is more than necessary. A chatbot (known as a conversational agent), is software technology that imitates real human interaction in a written or spoken way. It can be represented as a website bot, chatbot app, social media chatbot, as well as a voice assistant. The value of using this technology is that it saves time and expenses by automating customer support in an e-commerce space 24/7. Another plus is that it generates leads and, thus, revenue by gathering preliminary information about a client. As well, chatbots can redirect a prospective customer to the information they are most interested in. A great customer service chatbot example is Hipmunk. This travel search engine uses the technology for travel-related questions and recommendations on their website. Also, the office supply retailer Staples uses a chatbot to offer products based on order history. It even helps to complete a purchase directly through a chat. As the technology is relatively new, users will likely suspect that they are communicating with a robot; particularly when live-chatting. Chatbot technology is dependent upon a progression in NLP (natural language processing), and without considerable improvement in this field, it will remain a limited algorithm and continue to struggle with more complex speech (jokes, metaphors, dialects). On the other hand, with every passing year, e-commerce chatbots become more advanced and communicate more naturally. Who knows, they may become humanized to the extent we cannot distinguish them from real human beings. For additional insights, check the article Everything You Need to Know About Chatbots. Each new year will definitely bring more technological innovations to the online shopping industry. To stay visible, brands should discover new tech solutions that acquire loyal clients and provide a unique e-shopping experience. Currently, it is a must-have to be active on social media and to operate in the m-commerce sector. Meanwhile, the IoT is gaining popularity and is represented by smart devices like dash-buttons and beacons. Even still, there’s more to expect in the future of e-commerce sector. The successful cases of virtual reality, drones for delivery, voice assistants, and crypto-payments in the ebusiness spheres show that our journey of purchasing goods could exceed our imagination. Nevertheless, to stay competitive these days, mobile solutions are a valuable investment for any enterprise. It helps to adopt modern web and mobile app solutions to accomplish business goals.